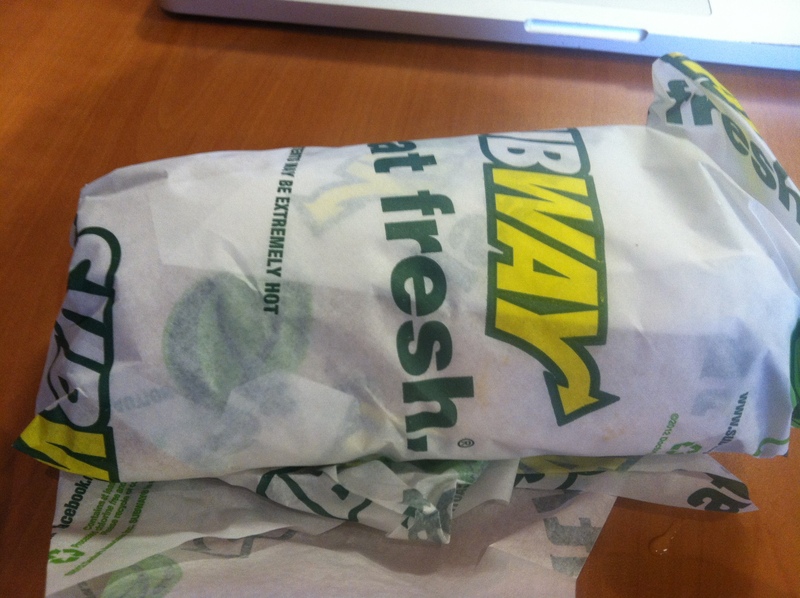 I don’t like Subway and it irritates me that so many people do. I realize that is a bold statement to begin a two-part review of Subway items, but I think it’s important to expose any potential bias so readers can try to filter that out and make their own decisions. I think my dislike comes from growing up in Massachusetts, where you can’t shake a stick without hitting a sub shop. Not all sub shops are great, mind you, but generally you can get a good sandwich with fresh ingredients. It may not cost $5, but it’s good. The $5 foot longs, I guess are a good deal if you like bread and lettuce sandwiches. They put so little meat (of dubious quality) on their subs, that when you create your sandwich, you’re really just choosing which seasonings/sauces you like because that’s all you taste. Well, now with that screed out of the way, let’s get down to business, shall we? 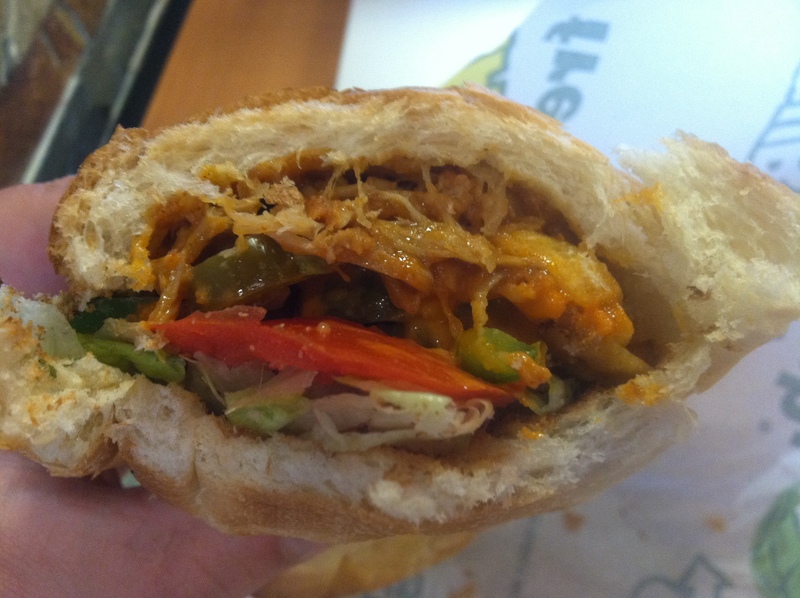 When I first saw Fritos Chicken Enchilada Melt, I put it on my list, and hoped that by the time it came up, Subway would have discontinued it. No such luck. When I stepped to the counter to seal my fate, I will admit I had no idea what I was doing. I haven’t been in a Subway for at least four years, and I was slightly overwhelmed by all the choices. I tried to recreate my sandwich as close as the advertisement as possible, but since I couldn’t find a standard, some of the ingredients were just my choice. I wound up getting it on white bread with green peppers, jalapenos, lettuce, tomato, creamy buffalo sauce and cheddar cheese, on top of the standard chicken, enchilada sauce and Fritos. 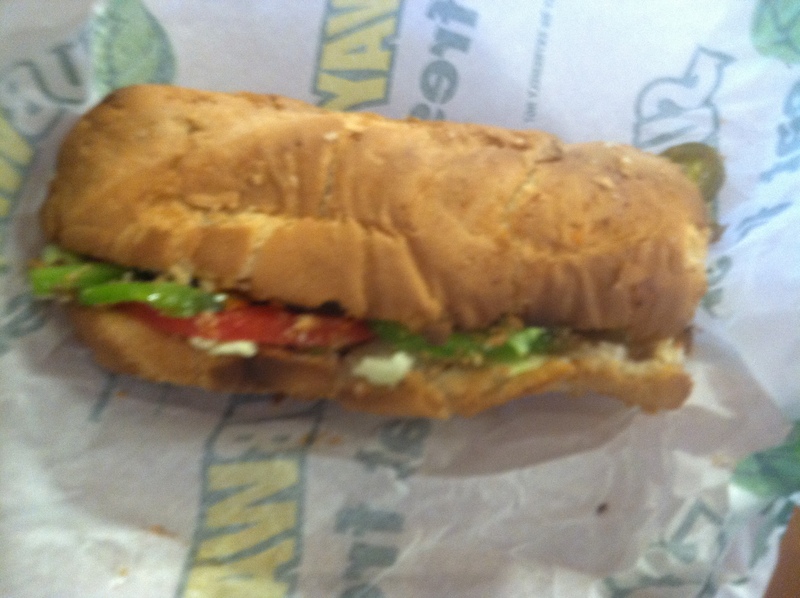 The sandwich itself was $5.25 for a 6 inch sub, so this isn’t part of the $5 foot long promotion. However, as a six inch sub, it is fairly filling if you aren’t starving. 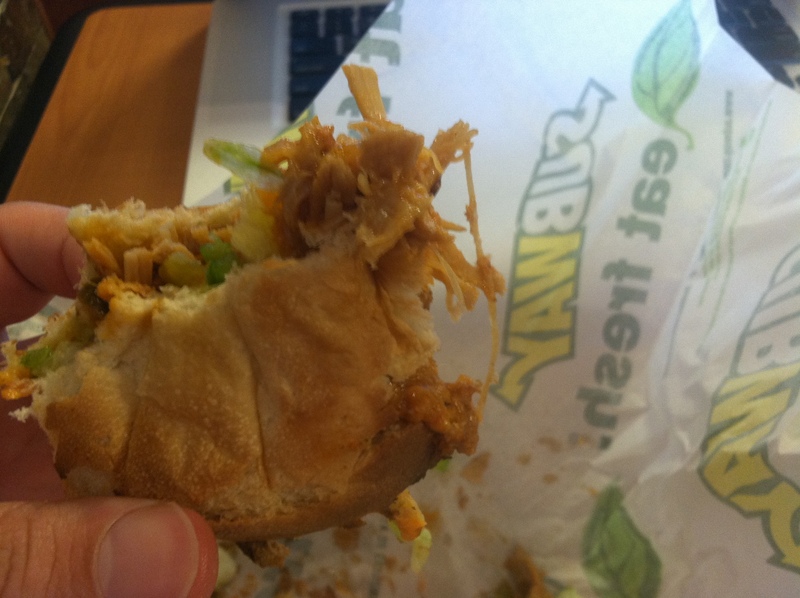 Subway says “Crunch into a pile of Fritos placed right on top of tender pulled chicken and authentic enchilada sauce for a new satisfyingly delicious bite of flavor you can’t find anywhere else!” I unwrapped the sandwich and… it looked like a mess. Maybe I put too many toppings on it, but it was messy. The bread did hold up better than I thought it would though. Other than some seepage at the end, I wasn’t overly reliant on napkins. My first bite was mainly bread, which was crusty and warm. Not a bad start. 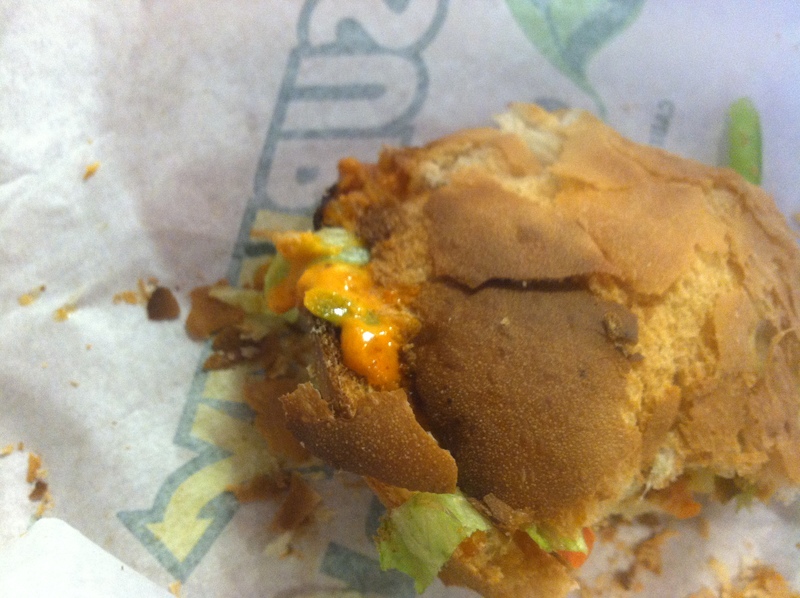 My second bite was really spicy. Almost too spicy. 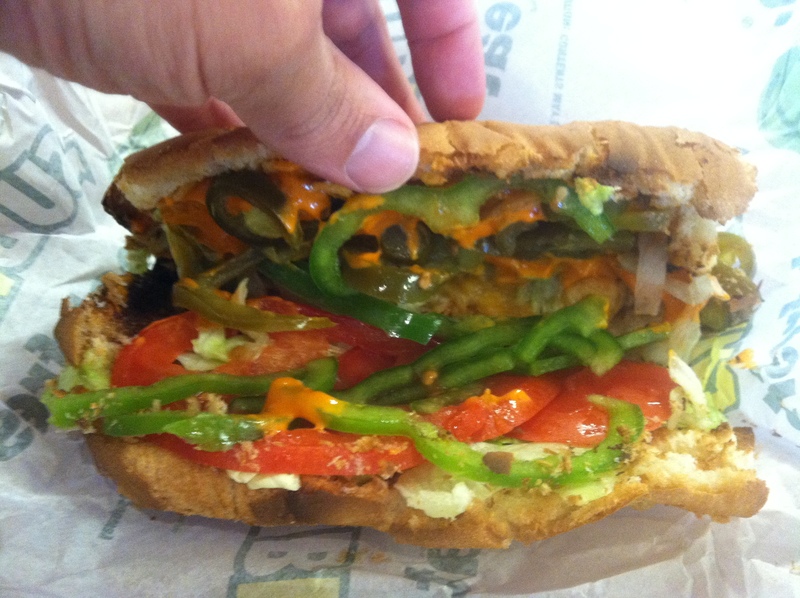 The jalapenos, green peppers and buffalo sauce definitely gave me a friendly hello. My throat was slightly burning and I needed a little timeout before I could continue. After, I got a bit of the Mexican flavor, which I assume was the enchilada sauce. I could taste the cumin and cayenne. I can’t attest to its authenticity, but it was fine. When I finally got to the Fritos, they definitely shone through all the other flavors. They provided crunch, more so than the bread. Their flavor got lost in all the spiciness unless I was paying attention to them though. The chicken was a problem. First, as I mentioned above, there probably wasn’t enough of it. Part of the problem is a distribution issue, it’s all concentrated at the fold of the bread, which did not cover a large surface area. 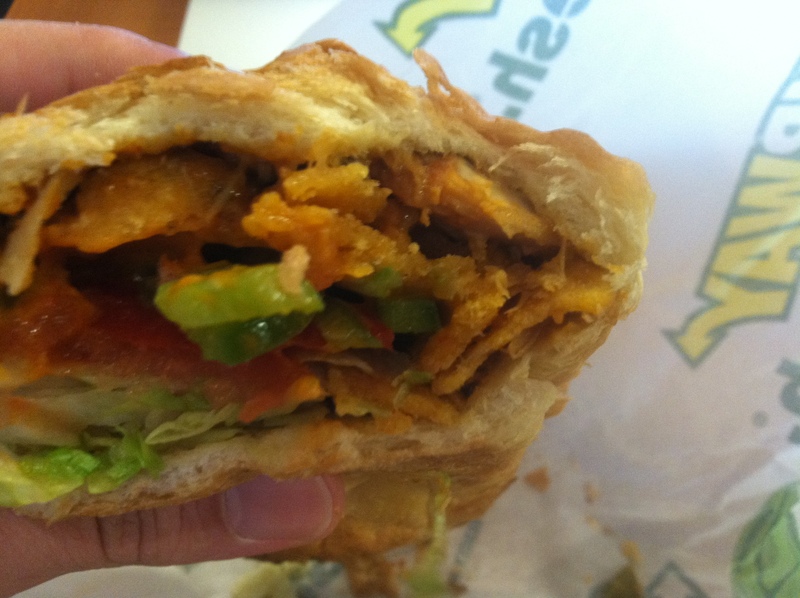 Certain bites were solely bread and buffalo sauce, then I got a veggie bite with Fritos, then a chicken/Frito bite. The flavors need to be more evenly distributed. Second, even if there had been more chicken, it still didn’t taste good. When I isolated some bits of it, it looked dark, so I’m guessing it was thigh meat. 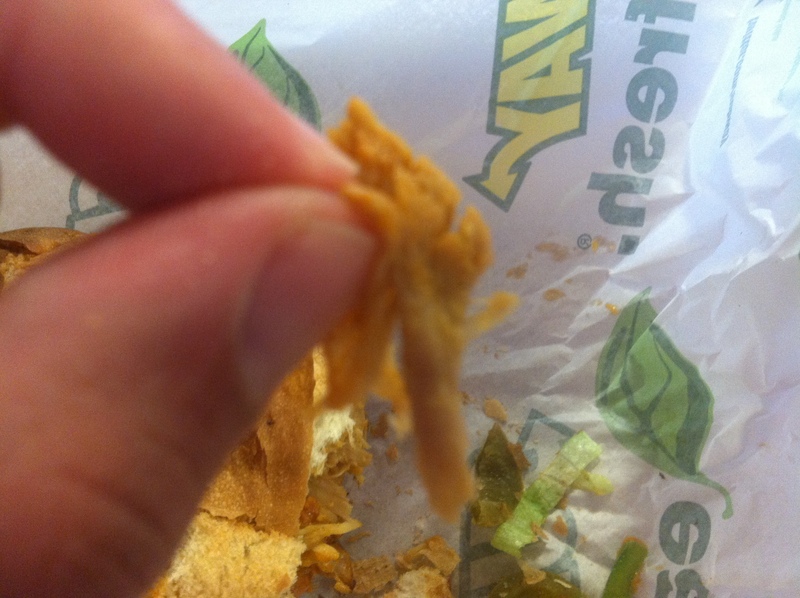 It was stringy and tasted processed (and this is coming from someone who LOVES chicken nuggets). Other than that, there was no real flavor to it. So, I wasn’t a huge fan of this. The chicken seemed to be there solely as a delivery system for the enchilada sauce, which wasn’t even terribly strong to begin with. The creamy buffalo sauce definitely delivered a more prominent flavor. To tie this back to the my opening paragraph, this is going to taste like the toppings you choose for it, because the chicken and enchilada sauce are not flavorful enough nor prevalent enough to take center stage. Maybe if you got the double meat option it’d be better, but then we’re edging close to $7 for the sandwich, and at that price, just go to a deli and get a real sandwich (or, you know, a Mexican restaurant for an actual enchilada).